PLEASE NOTE: Our Worship in the Park services will not be held at all in 2018. Please check back to see what happens in 2019! Come in a spirit of oneness with God, nature and our community. What a good way to start the year and the week. Please bring a chair/rug, water, sun hat, family and friends. 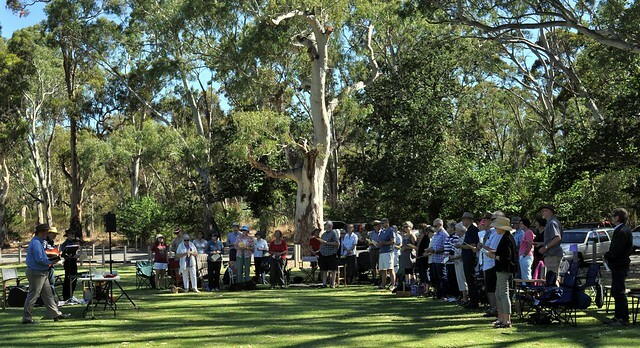 Parking is available right next to the Main Oval (drive through the Park gate and pay the day fee) or you can park in the Belair Golf Club car park and come through the gate in the fence – it’s just the other side of the Oval so not too far to carry your chair. There will also be worship in the Church during January with our 11am Traditional Services (click here for more information) actually being held at 10am throughout the month. See the maps below. 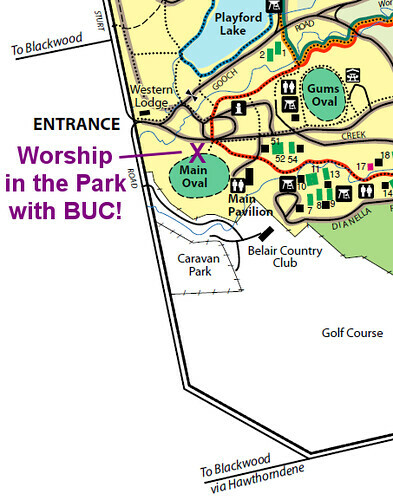 You can also click on the link to download a PDF brochure of Belair National Park that includes a map of where the Main Oval is.